Reverend George Claudius Taylor, Oakland and Westernport A.M.E. 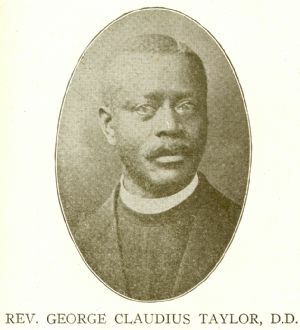 The Reverend George Claudius Taylor was born in 1862 and was converted and received into the African Methodist Episcopal (A.M.E.) church in 1879. He attended the Payne College of Augusta, Georgia from which he graduated in 1888. He later graduated from the Gammon Theological Seminary in 1893 and in 1903 was awarded an honorary degree of Doctor of Divinity from Payne Theological Seminary. He was very active as a preacher throughout Georgia prior to his transfer to Washington, D.C. where he was made the Presiding Elder of the Washington District. According to the "Centennial Encyclopedia of the African Methodist Episcopal Church, 1816-1916", it was the Reverend George Claudius Taylor who "built the church in Oakland, Maryland, and renovated the church at Westernport." Taylor is also acknowledged for paying off the debt on the church in Hagerstown which had been in place for twenty-six years, while leaving enough money to pay off a second mortgage that had been taken on the building. He was later assigned to Newport News, Virginia, and as of 1916, the date of the Centennial Encyclopedia, was based in Roanoke, Virginia. As noted elsewhere on this website, an Oakland A.M.E. church building is identified on a hand-drawn map as having existed as early as 1886. It is described as being of "primitive" construction, that being a structure built with available materials and tools but still basically sound. A 1906 professionally made lithograph of the town shows what appears to be a somewhat more substantial church building. In comparing the dates provided in the various sources, it is likely that Taylor "built" the church that is indicated on the 1906 litho, and which was later re-located in the 1930s. In 1854 an African-American Methodist congregation in Westernport purchased a vacated Methodist church building on Front Street. This was to become the Brown Memorial African Methodist Episcopal Church, and would necessarily have to be the church alluded to in the Centennial Encyclopedia as being renovated by the Reverend Taylor. Unfortunately the Centennial Encyclopedia did not provide any dates. The book is part of the Documenting the American South (docsouth) collection, at the University Library, The University of North Carolina at Chapel Hill. Title: Centennial encyclopaedia of the African Methodist Episcopal Church, 1816-1916. Author: Richard R. Wright, Jr. It is used with permission. The full write-up on Reverend Taylor can be viewed online at Centennial Encyclopedia of the African Methodist Episcopal Church, 1816-1916, Richard R. Wright, Philadelphia: [Book Concern of the A.M.E. Church], 1916. According to Washington County History in Black and White, by Andrea Rowland, the Ebenezer A.M.E. Church in Hagerstown was established in 1838. Another source, the Washington County African-American Heritage Guide, states that the A.M.E. church was founded in 1840, housed in several locations on West Bethel Street in Hagerstown, with their final location being razed in the late 1990's due to structural concerns.